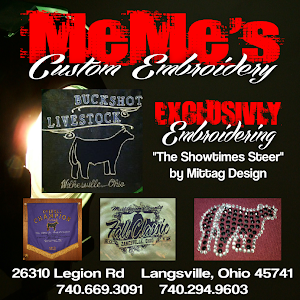 MITTAG Blog: Mittag "Showman's Choice" Consignments! 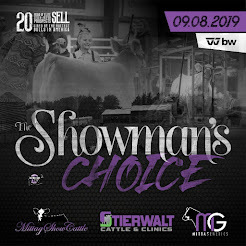 "The Showman's Choice Sale "Consignments. Lot #1………..Monopoly X Alias……WOW, talk about a consistent pedigree. This is the 4th year in a row that a Monopoly X Alias calf has been lot 1 in The Showman’s Choice Sale. This ET steer out of our Dalia Donor is a full brother to the $42,000 steer in our 2013 sale that went on to be the Grand Champion Steer at Aksarben, shown by Vada Vickland. Of the ET calves, this one reminds us the most of the Vickland steer, he is so complete and sound! Lot #3……I-80 X Monopoly/Simmental…………I’m a pretty big fan of the I-80 females and we have a couple in this year’s sale that prove why. This one will make a believer out of anyone! She is the daughter of one of Tessa’s former show heifers purchased from Matt Lautner and raised by Oakly Kershner. A maternal sister to this heifer was the many time Champion Chi heifer shown by Violet Lapke. Lot 3 is so neat made yet thick and sound….hard to find a hole in this girl. The mother of this heifer will become our next Donor! She has also been shown already and was the Grand Champion heifer at the Afton, Iowa Open Prospect Show. Lot #5……….MAB X Alias………….This Brockle Faced MAB is the perfect example of a “Fat Steer.” He is the natural calf out of Dalia, and maternal brother to Vickland’s Grand Champion Steer at Aksarben. This one is a truck and has impressed everyone by how super stout he is yet staying so smooth and sound! This one will do some WINNING early and late! He has already started his show career and was Reserve Champion Prospect Steer, Iowa State Fair and Grand Champion Steer Afton, Iowa Open Prospect Show. Lot #7……Monopoly X Alias………An ET full brother to Lot#1 and the Vickland Aksarben Steer. This one is so cool fronted, neat made, big boned and sound that he is sure to follow in the footsteps of his siblings. You better have space in your trophy room if you buy this one! Lot #9…….I-80 X Alias………………Charolais colored cattle seem to be the rage now and here is a really cool one! As soon as we put a picture of this heifer on the Blog and Facebook, we started getting texts and people were clicking “like”. Here is one super unique female. She blows people away with her Maternal Look, Freak Neck, Big Body and her Huge Feet. And yes….she too is out of an Alias cow! Her maternal brother was lot #1 and High Selling steer in last year’s Showman’s Choice Sale purchased by the Otis Family in Montana. 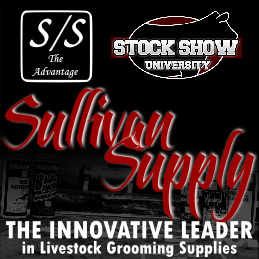 LOT #11…I-80 X A Step Up/Unforgiven……… This one could very well be a “Major Player” in the Maine division, he was the Reserve Champion Prospect Maine Steer at the Iowa State Fair. STOUT-SOUND-STYLE pretty much the 3 things you like about this one. 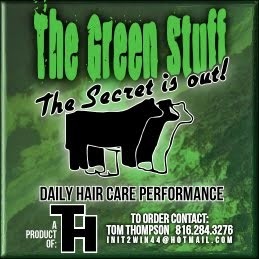 His mother is a first calf heifer we purchased through one of Matt Lautner’s online sales. This steer reminds us a lot of the I-80 steer Tyson Tucker purchased in last year’s sale and has shown very successfully this year. Lot #13 …..MAB X Maximus…….There is absolutely no other way to describe this red steer than to say he is really attractive! Those who have seen him have been totally amazed by how square hipped, cool fronted and elephant footed he is. This steer is a maternal brother to last year’s high selling heifer in The Showman’s Choice Sale purchased by Eric Walker of Arkansas. Lot #15…..Monopoly X Alias………..Here is the Wild Colored ET Brother of Lots #1,#7 and #27! This one got the extra splash to catch the judges eye and once he has the judges attention, they will notice his Huge Bone, Big Back and Stout Quarter. This one will be fun to show! Lot #17….MAB X Bachelor/Angus………..If you are serious about showing a commercial heifer that will make a simply awesome cow in the end, you better bid here! Really hard to fault this one…and who doesn’t love a Blaze Face! LOT #19…..Monopoly X Meyer 734…Here is a steer that couldn’t be bred any better! He is really complete and one of our favorites. Take a look at how smooth made this one is, and I think he will be a great feeding steer. 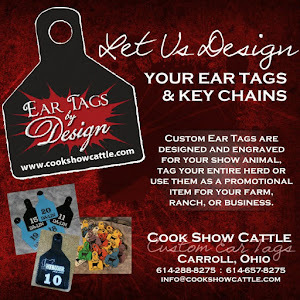 If you want to win a Market Steer Show…Buy this one! Lot #21…….I-80 X Electrify/Angus…..This one will get better every time he heads to the feed bunk. He is very correct in his structure and very attractive. He is out of a first calf heifer and we have liked this one a lot all year. Lot #23….MAB X Who Made Who…This one is the youngest calf in the sale and will be hard to forget once you see her. She is absolutely Giraffe Necked and Market Heifer Stout! She is the maternal sister to many Champion Steers in Kansas for the Rusk Family and Iowa for the Means Family. Lot #25….MAB X Sunseeker……….RED, WHITE & STOUT! This market heifer prospect is certainly made the way we all want a market heifer made. She has been a stand out since she was born. You can feel confident bidding on this one! Lot#27……..Monopoly X Alias……The final Mittag consignment to The Showman’s Choice Sale is a rare opportunity to own a full sister to the lots 1,7 and 15 steers. She is a beautiful blaze face heifer that will make a great show heifer and cow. This heifer is super sound and has that extra look like the rest of her siblings. A full sister to this heifer is the mother to the I-80 steer successfully shown by Tyson Tucker this year and heading to Aksarben.